The Wellcome Trust Arts Awards are devised to support imaginative and experimental arts projects that investigate biomedical science. The charity believes that the arts are an effective way of stimulating debate and engaging people with biomedical science. The arts also provide imaginative ways of engaging and educating young people in the field of science. Working with existing guidelines and photographic image collections the promotional material was designed with colour, relevant and striking photography and engaging typography. 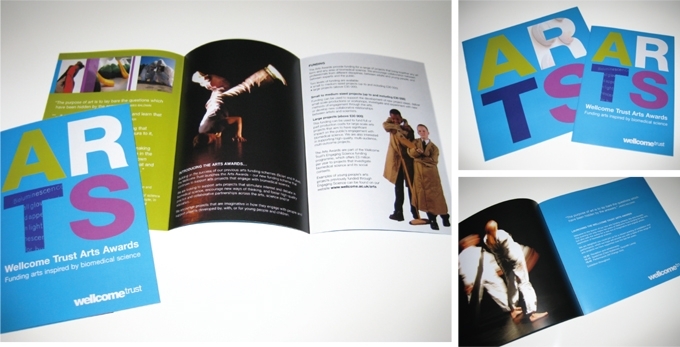 The material included leaflets, programmes, tickets and web banners. (Freelance for Wellcome Trust).